Often I don’t go in search for material but it keeps looking for me! A UFO organisation with links to the Chilean government is investigating eight reports of strange phenomena across New Zealand skies this year and says sightings are increasing. UFOCUS NZ director Suzanne Hansen told RNZ there was an emerging pattern of reported sightings of UFOs throughout the country, involving 'corridors' and 'hotspots' and that many sightings seemed to be associated with seismic events. She made her comments this week during the 40th anniversary of New Zealand's most famous UFO encounter, the so-called 'Kaikoura Lights' sightings on 31 December 1978, which were filmed by an Australian camera crew and enthralled millions of people across the world. The UFO research network has a co-operation agreement with the Committee of Studies of Anomalous Aerial Phenomena, a joint military, science and aviation body set up by the Chilean government, which also follows a theory that UFO sightings are associated with seismic activity and is investigating the link. The groups have carried out joint research projects and have been exchanging information since signing an official agreement in September 2013. The retired school teacher said the group's team of eight investigators had been busy looking into eight reports of UFOs this year. The team includes former air force staff, an astronomer and science and medical professionals. "Most reports we receive are from the North Island, which is probably because of a denser population," she said. "We hear a lot from cray fishermen, truck drivers and farmers, and there are hotspots with a history of reported sightings. "These areas include the Dome Valley, north of Auckland, which is a particularly creepy area, and the Kaipara region." She also pointed to a UFO 'corridor' stretching across the North Island, from the Bay of Plenty's offshore islands, through Tauranga and into the Waikato, where there had been a concentration of UFO reports over the past decades. Data released by the Civil Aviation Authority spanning the years between 2000 and 2017 showed it received 30 reports of UFOs, and interestingly there was a concentration of reported sightings across the supposed corridor Mrs Hansen described, as well as reports spread over the Wellington region and Canterbury. A mathematical theory postulated by former National Airways Corporation pilot and deceased Kiwi UFO figure, captain Bruce Cathie, suggested these supposed corridors were formed over natural energy 'gridlines' across the earth, which UFOs used to travel. One sighting the group had investigated this year took place on 28 February at Glenroy, Selwyn, in Canterbury and involved the daylight sighting of a "black aerial object". The witness, who held a private pilot's license, was riding his motorcycle when he saw an object approaching in the sky, which he described as being like "a squashed doughnut" moving extremely fast without sound. It was reportedly lost from view as it came close and passed over trees and was "about the size of a living room", he said. The witness told investigators: "I have flown (aircraft) a lot and I am familiar with most aircraft types, but this was really something else. "The sheer speed, dark colour and absence of any exterior features were quite remarkable, and I wished that the experience had lasted longer." Mrs Hansen said reported sightings were increasing overall in New Zealand. She became committed to investigating UFO phenomena following what she described as a harrowing UFO encounter as a 20-year-old teacher in Hawke's Bay during the mid-1970s. She had been travelling in a car between Takapau and Hastings on a country back road with a friend during late afternoon when they became aware of intense lights above the vehicle. As the lights got closer, she said they were accompanied by a "vibrational sound" that became higher pitched in frequency until the pair lost consciousness. She said when they became conscious again, they were still in the car driving, but it was now dark outside. "It was a feeling of shock and horror, of being unable to logically explain how one second you had spotted erratic lights while driving in sunshine and the next you were suddenly aware of driving in darkness and the lights were gone," she said. "My friend reacted with anger and disorientation, repeatedly shouting 'what the hell is happening'. It was traumatic." She said the pair estimated they had lost 90 minutes of time, which they couldn't account for. The troubling experience remained with Mrs Hansen and in the 1980s she became aware of UFO research in the United States, after which she began helping UFO expert Harvey Cook organise meetings in Tauranga. One of the most dramatic UFO events to be documented however happened 40 years ago today, on 31 December, 1978 - the Kaikoura Lights sightings. Spectacular light formations were spotted 10 days earlier by the crew of a Safe Air cargo plane. The lights followed them for several minutes before disappearing and reappearing nearby. They appeared on Wellington Air Traffic Control radar, on the aircraft radar, and were sighted by hundreds of people. Then between 31 December and 1 January, an Australian television crew recorded a similar incident onboard a cargo aircraft flying between Wellington and Christchurch. The large bright objects were filmed, tracked by Air Traffic Control and observed by witnesses simultaneously, with one of the objects following the aircraft almost until it landed. When the aircraft took off again, it was followed by a huge orb-like object for 15 minutes. Film footage stunned millions of viewers across the world. A report by authorities later dismissed the giant orbs as possibly reflected lights from squid boats. Did Trump go to Iraq to avoid a coup? December 30, 2018 "Information Clearing House" - Donald Trump’s visit this week to US forces in Iraq has to be seen as a highly peculiar move. Following his announcement to pull troops out of Syria and Afghanistan, which caused a split with senior Pentagon figures, it seems that Trump was making a desperate bid to reassure the military establishment. Perhaps even to forestall a feared coup against his presidency. For nearly two years since his election, President Trump had not visited US troops in any active combat zone, unlike all his predecessors in the White House. His apparent indifference to overseas forces had engendered much consternation from political opponents and the media. In a recent editorial, the New York Times admonished: “Put Down the Golf Clubs, Visit the Troops”. Recall, too, the US media scorn heaped on Trump when, during his trip to France in November to mark the centennial end of World War One, he declined to pay his respects at an American war cemetery “because it was raining”. Trump is therefore not the sort of person to put himself in discomfort for others. That’s why it seems all the stranger that on Christmas Night, December 25, the president and his wife Melania left the comfort of the White House, and boarded Air Force One for a 6,000-kilometer overnight flight to Iraq. The journey to Iraq was variously described in US media as a surprise and “shrouded in secrecy”. So secret indeed that the Iraqi government was not even informed in advance of Trump’s arrival. A hastily proposed meeting with Iraqi Prime Minister Adel Abdul-Mahdi did not take place because the Iraqis were only given a couple hours notice when the US president landed. In total, Trump and his delegation spent only three hours in Iraq and a reported 15 minutes talking to troops at Al-Asad Air Base, near the capital Baghdad. The president then flew back to Washington, making a brief refueling stop in Germany. Talk about a whirlwind spin halfway around the globe – and for what? What this all suggests is that Trump’s visit was a hasty, ad hoc event that appears to have been done on the spur of the moment, in reaction to the news cycle over the past week. Mattis’ resignation, followed by that of another senior Pentagon official, Brett McGurk, showed that there was serious pushback from the military establishment to Trump’s pullout order from Syria and Afghanistan. Not only that but Trump’s political opponents within his own Republican party and the Democrats were given extensive media coverage for their protests against his order. As CNN reported: “James Mattis’ resignation triggered an outpouring of anxiety and anger”. Senators were lining up to condemn Trump for losing “the adult in the room” and a “voice of stability”. Mattis was hailed as “a national treasure” and praised for his “moral compass”. The eulogizing hardly squares with Mattis’ record of war crimes committed while serving as a Marines Corp general during the siege of Fallujah in Iraq in 2004, nor his psychopathic humor extolling the “fun of shooting people”. Not for the first time, Trump was being denounced as a “traitor” by political enemies in Washington and the media. It was reminiscent of the way he was vilified after holding a summit with Russian President Vladimir Putin in Helsinki earlier this year. Trump was again accused of “giving a gift to Putin” with his plan to withdraw US troops from Syria. This time around, however, the political atmosphere was even more seditious. By ignoring national security advisors and “the generals” over his Syria and Afghanistan announcements, Trump had crossed swords with the military-intelligence establishment. There was also a strong sense that the usual anti-Trump media were seizing on the opportunity to whip up Pentagon dissent against the president by lionizing Mattis as a “great leader” and whose absence would sap morale in the ranks. The brooding political and military climate in Washington over Trump’s singlehanded decision-making may be the explanation for why the notorious couch-potato president felt compelled to get off his backside and head to Iraq in the middle of the night – on Christmas Night too. Significantly, Trump added a new dimension to his pullout plan for Syria and Afghanistan. He pledged that US troops were not leaving Iraq – despite nearly 16 years being there after GW Bush first invaded the country in 2003. He also said that American forces would launch strikes into Syria from Iraq in the future, if and when needed. Presumably, this rapid-reaction force applies to all other Middle Eastern countries. In other words, Trump is not signaling a peaceful scaling back of US militarism in the region, as some of his critics and supporters have perceived. Trump is simply rationalizing American imperialist power, making it leaner and meaner, to be operated out of stronghold bases like Iraq. Notice how the Iraqi government was not consulted on this Neo-colonial plan, which speaks of Washington’s arrogant hegemony, regardless of who resides in the White House. Trump’s rushed visit to Iraq seems to have been made in an urgent attempt to let the Pentagon and the military-intelligence establishment know that he is not “going soft” on pursuing America’s self-ordained right to wage wars anywhere it wants for the cause of US capitalism. In the immediate confusion over Trump’s announcement on December 19 of a troop drawdown in Syria and Afghanistan – and the media deification of “Mad Dog” Mattis – a dangerous period fleetingly opened up for his presidency. Running scared, Trump dashed to Iraq to let the generals know that this president is still a reliable tool for American imperialism. Senator Lindsey Graham meet with Trump today to discover new information on Trump Syria withdrawal and seem to indicate a broader war if you examine Turkish movement on the ground as well. Transformers blow in power surge cause panic of new weapons test but are they real? The Idlib area of Syria has been a major problem for everyone because it is the location to which "rebel" fighters were "evacuated" when the Syrian Army - with Russia's help - began winning back control of their country. Outside countries which helped those rebels wanted to assure they would be safe in Idlib, and agreements were made that Idlib would not be attacked. Minutes ago, that all changed. For the first time in months, both Syrian and Russian fighter jets and bombers are aggressively bombing, strafing, and shooting at targets in and around Idlib. This is a MAJOR change in the status quo. Unexpected and very bloody. 6:59 PM EST -- Developing fast, check back for updates. . .
Over the past 24 hours, members of illegal armed groups violated the ceasefire agreement in 20 areas of Syria's Idlib de-escalation zone, a trusted source in the Russian Defense Ministry says. "Over the past day, terrorists mortared Darh Abu Assad (three times), Mamuhiyah (twice), Akch Bair, Ikko, Sandran, Beit Zivan and Kirmil, Latakia province, Braididj (twice), Tell Bazzam (twice), Tell Marak (twice), Zor Mahruka (twice), Zellakiyat, Kibriya, Mgair, al-Rasif and Achan, Hama province, and the area of science and research center, the district of Sukkari in Aleppo city," the source revealed. A Syrian serviceman was killed as a result of the militants' attack on the settlement of Kirmil. Airstrikes & missile strikes on Jisr al-Shugur town in western Idlib. Confused reports from Jisr al-Shughour. According to some people living there there, Russia and SyAf are carrying multiple airstrikes. Targeting villages near Latakia with bombs. Unclear if mortar shells are used. According to a military source in the Latakia Governorate, the Russian Air Force launched several airstrikes over the jihadist-held towns of Baksariyah and Marand, hitting a number of sites controlled by the radical groups in this area. The aforementioned towns are located inside the Jisr Al-Shughour District near the Turkish border. Typically, when the Russian Air Force carries out airstrikes in this part of the country, it is because they have information about jihadist movements in the area. Sources on the ground saying suddenly quiet now. No sound of any more aircraft. No sound of any more explosions or gunfire. Whatever was hit, was hit VERY FAST and EXTREMELY HARD. Already reports of "lots of dead Jihadists." Still all quiet. Numerous dead Jihadists. Looks as though this may be over. 2018, the year that passed. Take a look forward to 2019. The U.S. Environmental Protection Agency (EPA) is well known for working directly with industry lawyers and lobbyists to ensure that corporate interests are served first, second and third. Whether it’s rule-making or regulation-changing at the federal or state level, the high-paid corporate lobbyists are always the first through the EPA door. Who has not heard or read on the internet about the “Environmental Protection Racket”? With that understanding the EPA has just committed the biggest and most transparent blunder in its history. The profound and unparalleled transgression against the American people and environment concerns coal fly ash. Coal fly ash is one of four types coal combustion residuals (CCRs) which are produced by industrial and power plant coal-burning. Current air pollution control standards require that it be captured prior to release by the appropriate pollution control equipment. Fly ash is generally captured by electrostatic precipitators or other particle filtration equipment before the flue gases reach the chimneys of coal-fired power plants. That is one half of the context of the EPA’s historic violation of the public trust. The other half concerns the fact that coal fly ash has just been identified as perhaps the largest component of the chemtrail aerosols which are sprayed worldwide by chemical geoengineering programs. In other words the coal-burning industry is rightly required to remove the coal fly ash in order to meet pollution control standards, so that it can be sprayed right back into the atmosphere via ongoing chemtrail operations. After a long regulatory process, the EPA published a final ruling in December 2014, which establishes that coal fly ash does not have to be classified as a hazardous waste under the Resource Conservation and Recovery Act (RCRA). Because it directly concerns the air that we all breathe, that December 2014 ruling by the EPA subjects every U.S resident to dangerous and unacceptable levels of highly toxic air pollution. Not only has the EPA allowed for a perilous reclassification of coal fly ash, it has permitted the ubiquitous chemical geoengineering programs to pollute the skies and waters of the USA with chemically-mobile aluminum, as well as with mercury, lead, arsenic and various radioactive solids. It was the high integrity investigative research of J. Marvin Herndon, Ph.D. which confirmed that the very same toxic coal fly ash captured in the smokestacks of coal-fired power plants is used to generate immense chem-cloud cover across the planet. In his landmark, peer-reviewed, scientific research paper recently published at the International Journal of Environmental Research and Public Health he confirmed that coal fly ashis a primary constituent used in the chemical engineering formulas which are utilized to produce chemtrails. Massive chemtrail operations are now conducted day and night throughout the skies of the world. The chemtrails then unfailingly and quickly morph into chem-clouds. The chemtrail operations are most commonly executed prior to forecasted rainfall, thunderstorms and other low pressure weather events. In this way the chemical aerosols naturally undergo their predictable reactions and breakdown, and eventually fall to the Earth. Two methods are employed: (1) Comparison of 8 elements analyzed in rainwater, leached from aerosolized particulates, with corresponding elements leached into water from coal fly ash in published laboratory experiments, and (2) Comparison of 14 elements analyzed in dust collected outdoors on a high-efficiency particulate air (HEPA) filter with corresponding elements analyzed in un-leached coal fly ash material. The results show: (1) the assemblage of elements in rainwater and in the corresponding experimental leachate are essentially identical. At a 99% confidence interval, they have identical means (T-test) and identical variances (F-test); and (2) the assemblage of elements in the HEPA dust and in the corresponding average un-leached coal fly ash are likewise essentially identical. The critical point here is that coal fly ash is the primary ingredient of the basic chemtrail formula. 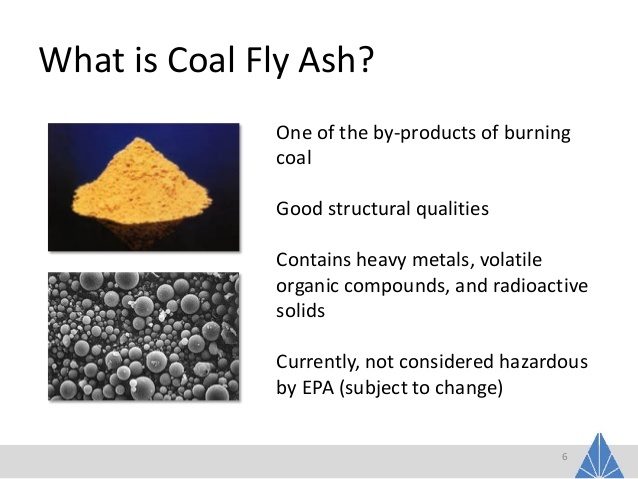 Coal fly ash contains a high percentage of aluminum oxide, one of the most prevalent chemical compounds found in coal fly ash. It is elemental aluminum which is found in unusually high concentrations in both the water and air wherever chemical geoengineering via chemtrail operations have been conducted with regularity. Given the enormous volume of coal fly ash that is sprayed into the troposphere and stratosphere by chemical geoengineering programs, there is now a tremendous amount of chemically mobile aluminum that makes its way into the ambient air of human populations everywhere. The effects of this manmade environmental catastrophe and ever-evolving public health disaster are only now beginning to be understood. For instance the olfactory nerve of a human being is surrounded by what is essentially an attenuated blood-brain barrier. Because of this little-known fact, the quality of the air that we breathe can have major consequences. If we are constantly breathing aluminum-laden air, that aluminum can end up traversing the blood-brain barrier and entering the brain tissue. 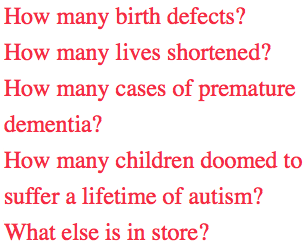 Witness the explosion of those diseases which are associated with aluminum toxicity and/or poisoning, as noted by Dr. Herndon. A true blood-brain barrier is 8 cells in thickness. The number of cells which constitute the layer around the olfactory nerve is only 4 to 5 cells thick. Animal life is also being greatly harmed by the incessant exposure to atmospheric and waterborne aluminum. 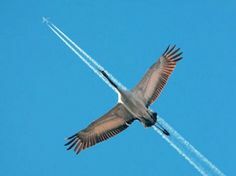 Birds, in particular, are now highly vulnerable as they fly through chem-clouds and low-hanging chemtrailed air on a regular basis. Their delicate lungs and upper respiratory systems are being overwhelmed by all of the toxic pollutants being delivered by chemtrails. Likewise, the land-dwelling animals are susceptible to the contaminated water and food supply as the toxicities bio-accumulate up the food chain. So, too, is there profound and pervasive injury being inflicted on the entire plant kingdom. 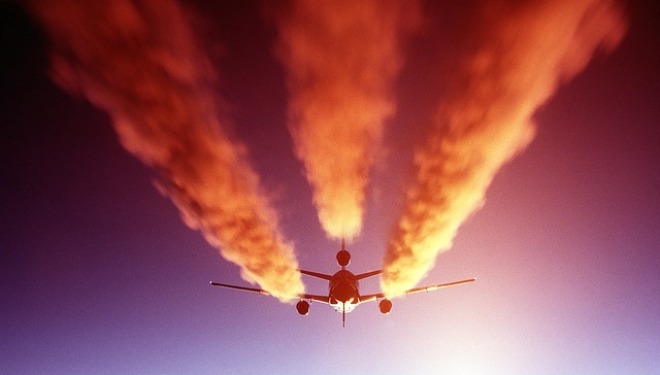 Aluminum has now been shown to accumulate in the roots of plants which grow under chemtrailed skies. The significant increase in the amount of bio-available aluminum due to rains from chem-clouds has contributed considerably to soil acidification. The higher concentrations of aluminum are stunting the normal development of plant roots, which have in turn reduced plant growth. This sole development, which has occurred since the beginning of chemical geoengineering utilizing coal fly ash, represents the single greatest environmental catastrophe of the modern era. And, it is the Environmental Protection Agency that has enabled the whole misguided endeavor. In so doing, the EPA has profoundly violated its charter by permitting the spraying of so much coal fly ash into the skies across America. By ignoring the systematic and intentional “dumping” of so much coal fly ash into the air, onto the land and into the waters of the USA, the EPA has essentially relinquished its role as America’s environmental guardian. The agency has, in effect, set itself up for closure, for it no longer serves the people or the environment. On the contrary the EPA often works aggressively against the best interest of the citizenry (remember the BP Gulf oil spill and Corexit). The terrible tragedy here is that the EPA has gone out of its way to perform in a manner that is completely contrary to its statutory mission. They have functioned like the physician, who has taken the Hippocratic Oath to “First, Do No Harm“, and then ends up becoming a serial mass murderer … LITERALLY! Does the EPA ever stop to consider just how many lives are being taken by the coal fly ash-driven chemtrail operations? Do they ever wonder how much pain and suffering their lack of environmental stewardship has caused the American people? Seven people have drowned as a heatwave grips Australia, sending big crowds to the beach to cool down, while a tropical depression in the far north threatens to turn into a cyclone by New Year's Day. Five of the deaths were in the southeastern state of Victoria between Christmas Eve and Saturday. A South Korean drowned on Christmas Day while snorkelling in a lake in the eastern state of New South Wales while another man died in the surf on the Sunshine Coast in the eastern state of Queensland. Temperatures have soared to well over 40 degrees Celsius (104 F) from Western Australia down through the sparsely populated central desert into the populous eastern seaboard states for seven days, with the weather bureau predicting the heat to continue after a brief New Year's Eve respite. "Over the coming days the heat will contract inland but will build again from mid-week on Wednesday," said Jonathan How, a forecaster at the Bureau of Meteorology. The bureau's "extreme heatwave" warning included Australia's most populous city, Sydney, but sea-side cities including Hobart, Adelaide and Melbourne were cooled by sea breezes. For the four-fifths of Australia's 25 million people who live on the coast, summer's heat typically sends them out to laze on the beach. But for those who live in the arid centre, there is little respite. At the Kulgera Road House, near the centre of Australia where the nearest town has a population of just 15, the temperature was so high the petrol pumps seized up. "It's so hot the fuel doesn't flow," said Shelley Safran, the acting manager, by telephone. 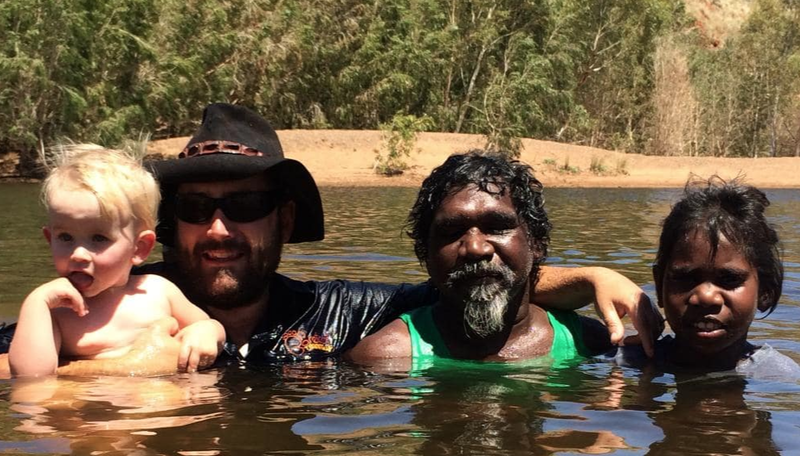 The recent hot spell broke records on Thursday at Marble Bar in Western Australia's mineral-rich Pilbara region, where the mercury hit 49.3 Celsius (120.74 F), the highest recorded since the weather station opened in 1999. December is the beginning of the Southern Hemisphere summer and the season brings cyclonic rains to the country's far north. A tropical low has formed off the coast of far north Queensland which the weather bureau says has a moderate chance of developing into a cyclone over the next few days. The bureau issued a storm warning on Sunday for damaging winds and flooding rains over the Cape York Peninsula on the far northern tip of Australia, including the bauxite mining town of Weipa. Was there an alien presence in NYC last night? Wesley Clark : Did Erdogan Blackmail Trump? Withdrawal from Syria - it's happening! An update on the Oroville "chemical explosion"
Tsunami in Indonesia DESPITE NO QUAKE!